Before we really jump into this endeavor though, have you picked up your Christmas photo with Santa from the night of the Christmas Parade at Frida’s? 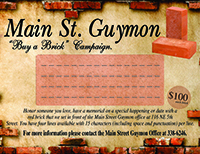 Oliver Marquez does a wonderful job volunteering to take those photos for Main Street Guymon and I hope everyone enjoys them. There is always a line for Santa, so it must be pretty popular. Santa certainly is a popular guy. And while you’re doing a little catching up, did you see the December “On the Bricks” show on PTCI’s Channel 2? If you don’t have Channel 2, then goon your computer to http://video.ptci.net and click “videos” and on the left you’ll see “On the Bricks.” There’s some good information on there! In the Rotary magazine, “The Rotarian”, there was an article about being careful about being a saver. They’re basically saying that if you have lots of stuff it is hard for your family when you die. Hard on their back, hard on their time, hard on the garbage collector, etc. They gave a few pieces of advice that I found exceptional. #1. Never photograph a church. Not even Notre – Dame. Your children do not want a photograph of any church on earth. #2. Never photograph an animal in a zoo. Not ever. #3. Throw away your old tax returns, your canceled checks from long ago. #4. If you break a piece of pottery, toss that too, unless it was thrown by Picasso. #5. All of your homework and notebooks from high school and college? Recycle. No one, not even you, will ever read any of it. #6. Letters from early boyfriends or girlfriends? Bonfire of the vanities. See, because I am so far from a saver, this makes sense to me. And stuff really just holds you down, in my opinion. But there is another side that came to mind after reading the article. If you don’t like your children … save everything. Don’t like your grandchildren? Put a few dollar bills amongst junk mail, maybe credit card approval letters, so they can’t just junk the whole box, but need to go through each piece. Yes, this is a way to be mean and evil and unkind to those you dislike. Don’t tell my mama. I wasn’t always the easiest child …. Don’t miss the 9th Annual Dinner, Dance and Draw Down at Pickle Creek on Jan. 26 at 7 pm. It’s located at 822 NE 6th Street and costs $50 to get in. There they have the Wooden Nickel Band performing and you get great food. It’s BYOB and with the purchase of a ticket you have the chance to win $5,000 (that’s the Draw Down)! All of this is a fund raiser for the Pioneer Days Rodeo. That Chamber Pioneer Days Rodeo Committee works all year long to bring us the world-wide wonderful Pioneer Days Rodeo the first weekend in May. Support those who are working so hard in our community! That is such good advice on how to gain friends and squash your enemies. Gosh, I’ve only made a dent in my folder, but the column is getting longer than a reasonable person would want to read. Don’t miss the Stampin with Sharlene class on Jan. 10th from 7 – 9 pm at The Studio, 3rd and Roosevelt in Guymon. This is for creative people or those who want to be more creative and everyone works together making cards. They’re awesome. And they’re nice to give to your friends and family. Wow, the friends and family would probably save them. Then when they pass, their family will have to deal with them. Hmmm, a vicious circle. But I really believe even the family would enjoy seeing these gorgeous cards made with so much love.